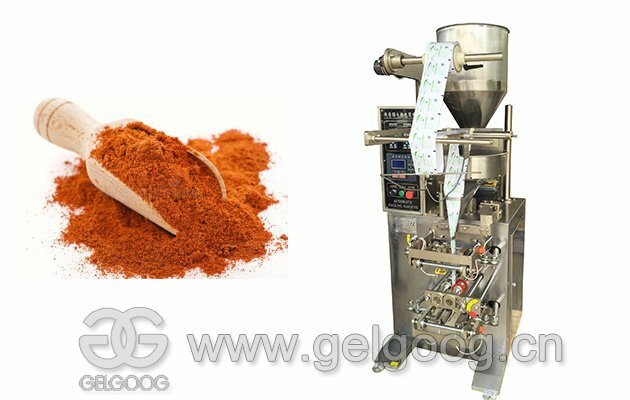 Suitable for production of peanut butter, almond paste, sesame tahini, sun butter. 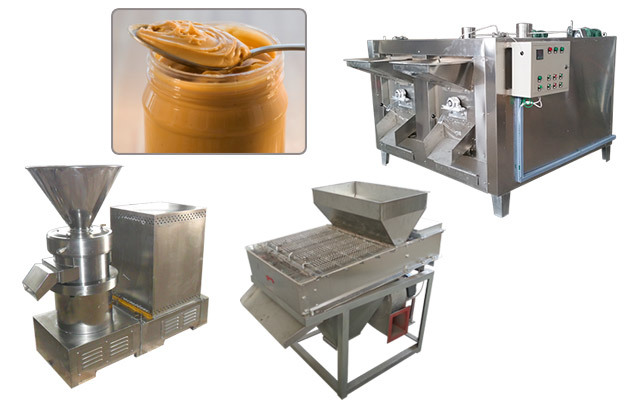 Flow production, high automation, easy operation, can produce different peanut butter. 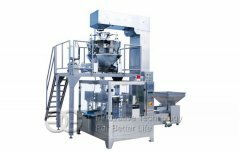 High Quality 500 kg/h Peanut Butter Production Line for Sell! 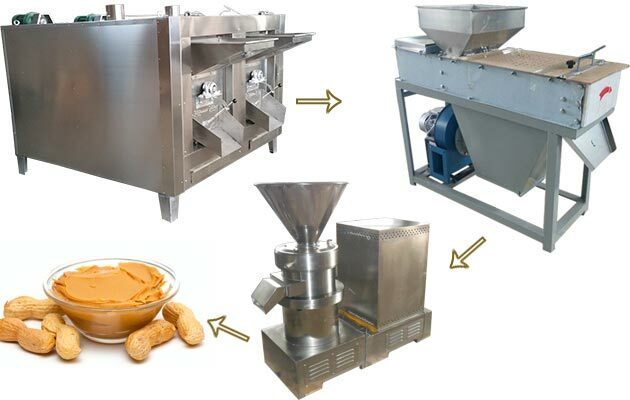 The capacity of this peanut butter production line ranges from 100kg/h-1000kg/h according to customer's request, can meet production requirement for small scale and large production capacity. Our company provide turnkey project with factory price. 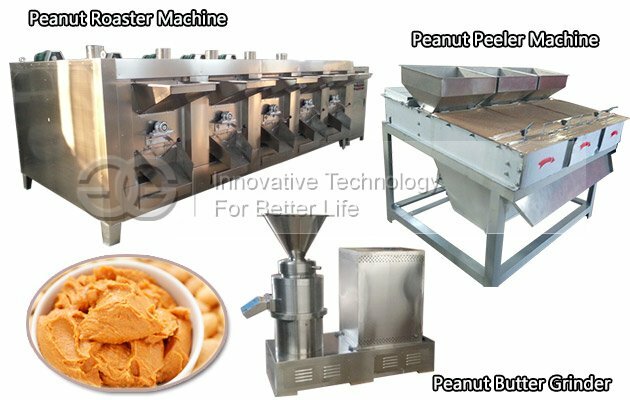 This peanut butter production processing line is developed and manufactured by reference of foreign tech and customers' feedback. 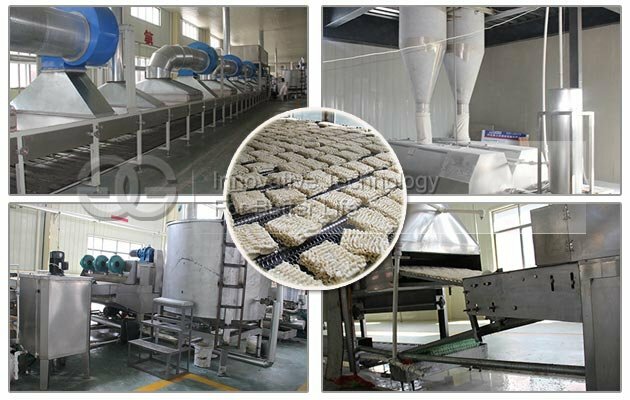 This small scale production line consists of feed elevator, peanut roaster, conveyor, cooling machine, decorticatingroasted peanut peeling machine, sorting conveyor, peanut butter grinding machines, pump, storage slot, cooling machine, mixing machine, vacuum deair, etc. 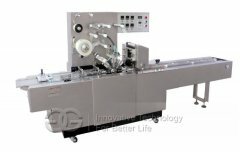 It has advantages of high automation, easy-operating integrated control, stable performance, high product quality, etc. 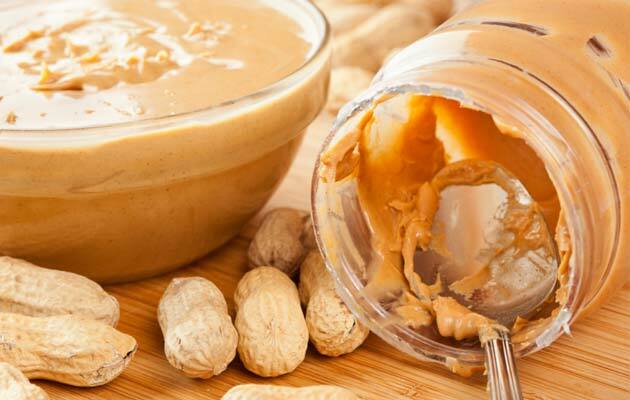 Selecting peanuts -- Removing the peanut shell -- Baking peanuts -- Cooling roasted peanuts -- Rpasted peanuts skin peeling -- Grinding peanuts into butter -- Peanut butter mixing -- Vacuum degassing -- Filling butter into bottles. 2. 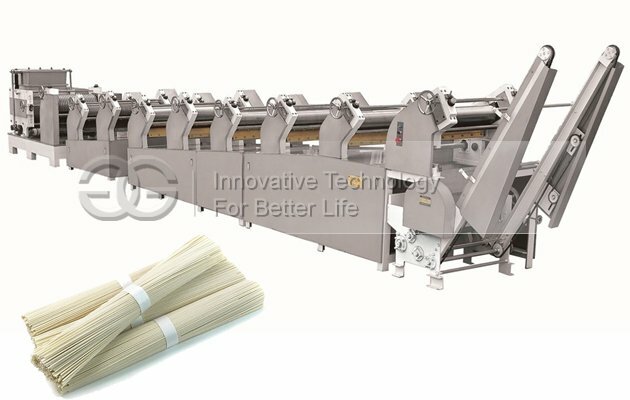 More options in butter production applications, advanced structure design, easy operation and cleaning and energy-saving. 3. Parts contacting food are made of 304 stainless steel material, ensuring good quality and service life of machines. 4. Imported electric appliances, such as Omron, Siemens, Schneider, etc. ensure the stable working performance without defaults. 5. Suitable for small factory or new factory business. 4. Guarantee: 12 months after it is sent out. 1. 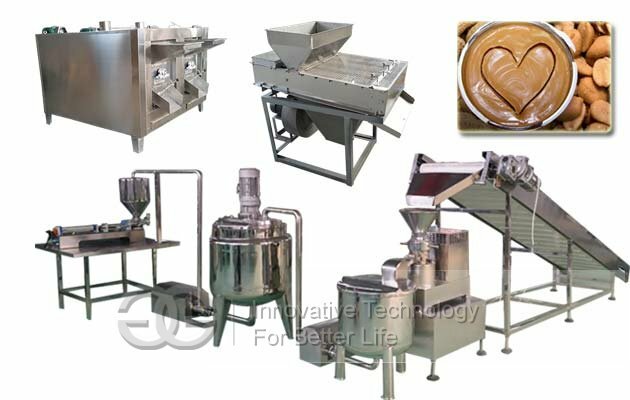 Do you have manual or video for peanut butter production line operation? 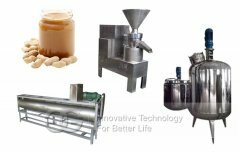 We can provide you video of the peanut butter processing, you can see how peanut butter are made? 2. 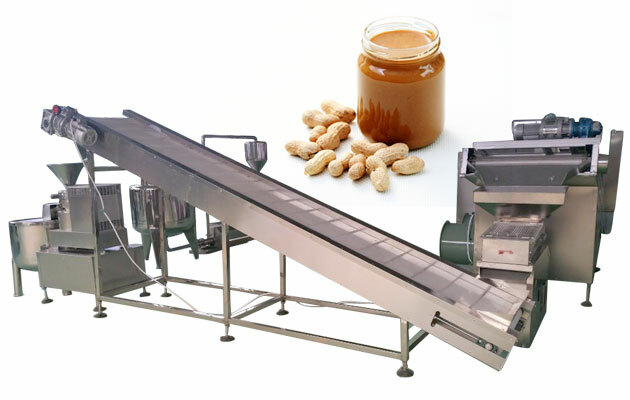 What is the price of smal scale peanut butter processing line? Due to the uncertainty of the model, material, specifications and customer requirements, so actual price needs to be confirmed by the customer after telephone communication with the relevant personnel of our company. The relevant personnel will determine the actual price according to the design plan of the customer. Usually we will send you quotation and price within 24 hours, except in holiday and weekends. 4. How can you ensure the quality of this peanut processing line? 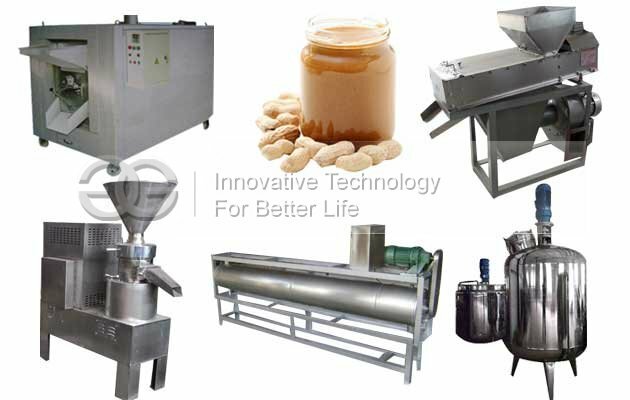 Our factory is pioneer in manufacturing peanut processing machinery, More important, we put a high value on our reputation. Competitive price with best quality is our principle. And if there is any problem during operation, we can solve by telephone or send engineers to your country.